The Quran and Prophet Mohammad urged Muslims to seek knowledge and become enlighten as they did successfully from 800-1250 CE. However, today a majority of Muslims lack a proper educational and economic infrastructure to pull themselves out of the “ignorance” quagmire which has led young men to follow the bearded men (not all bad) who are leading them to jihad, terrorism and committing crimes against humanity totally forbidden in Islam. 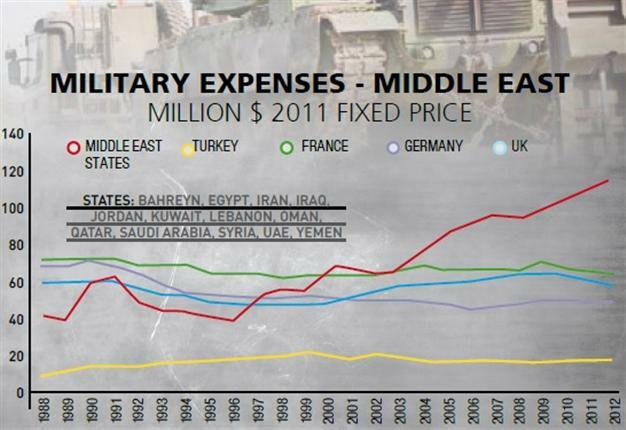 According to the Stockholm International Peace Research Institute (SIPRI) data Middle Eastern countries (richest in the Muslim world) spending on Military hardware has increased 300%, i.e. 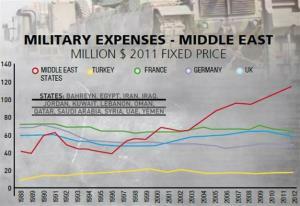 from an average of $40 billion on Military in 1998 to $120 billion per year now. On the other hand the data shows that the Middle East is spending far less on education and lags behind not only the developed world, but also the overall world average. What a pity as Petro Dollars are used as personal property to fulfil personal agendas of power and greed. Keeping masses unenlightened also keeps the autocratic rulers safe in their thrones, palaces and villas. The World Bank and OECD (Organization for Economic Co-operation and Development) studies show that the global average for educational investment is around 5 percent of the national budget and this number being much higher in Western and Far-Eastern countries, 5 to 10%. On the other hand, the Muslim countries spend from 1 to 3% with the exception of Turkey which spends 4.2%. It is difficult to fathom why the Muslim world would spurn the learning which is the basic teaching of Islam and continue to march on the path to the dark ages. Could this be the reason why today Muslim countries lack in innovations, manufacturing and the digital revolution while leading in jihadism, terrorism, violence, women slavery and illiteracy?